I usually don’t read memoirs–mostly because they feel self-absorbed to me. There are few things more self-involved than writing an entire book about yourself. I suppose I gravitate toward fiction because the author’s voice can be couched in characters’ voices. 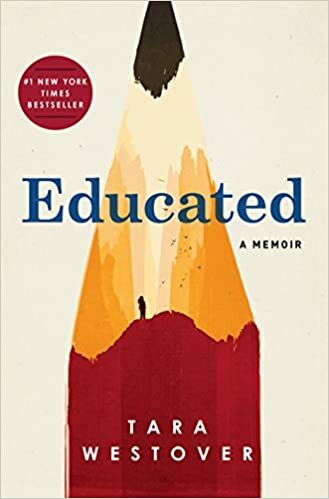 But occasionally I find a memoir that’s every bit as good as fiction: Education is one of them. Not only is the writing excellent, the story itself is bonkers. Tara Westover grew up in rural Idaho to a mentally ill father with delusions of grandeur and a mother whose primary household function was enabling physical, verbal, and emotional abuse. In spite of a childhood with no formal education–and very little informal education–Westover finds a way to go to Brigham Young University. After graduation, she studies at Cambridge and Harvard, eventually earning a PhD. She does all of this in spite of her family who are determined to keep her from learning and growing as a person. What I liked most about the book–aside from the extraordinary writing–was Westover’s ideas about education. I wanted to read more about how she evolved from a kid who had never read much of anything besides The Book of Mormon to a graduate student studying some of the greatest Western philosophers of all time. I would love to know if she thinks anyone can become educated as she did or if she recognizes how singular she is. And I’d love to know exactly which ideas really paved the way for her to break out of her family’s narrow world. Westover is a significantly more forgiving and understanding person than I am. I know her father had a mental illness, but the entire family suffered from his paranoid illusions. Between the father’s obsession with the end times, her brother’s physical abuse, and a total lack of intervention from every other adult in her life, it’s a wonder that Westover can paint such a fair picture of her family members. My version would be a lot angrier. Pick up the book for the beautiful writing. Stay for the incredible triumph. Agreed: I wanted to know more about her process or learning on many levels. How she got a 28 on the ACT with very little preparation and huge gaps (i.e. the Holocaust) and, as you say, transferred reading scripture to academic papers. And, then, finally, what she believes this says about testing and how we do education. Those are exactly the questions I had. Did you like the book overall, though?